Grill Parts specially made for you, are mostly grill mats that are custom cut shapes of metal sheet that fit exactly under or right before your outdoor grill. 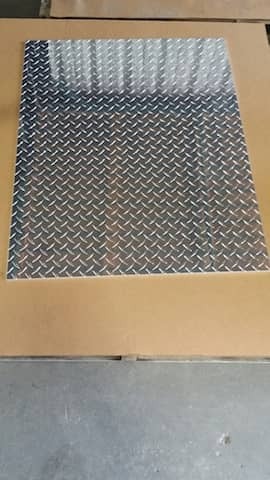 Grill mats made out of aluminum diamond plate can have any shape you want or need. Many shapes like the rectangle, triangle or a half a circle you can configure and order online on our website. For all other shapes we would need a sketch of how it should look so it fits to the area where you want to place it. The aluminum diamond plate is ideal for this purpose as aluminum is not rusting and is durable. Even if fat from your steak or burger drops you wil not step into it as the raised pattern helps to prevent that. The second part are specially for Weber Gas Grills which use the flavorizer bars. We fabricate them out of stainless steel. Basically they are stainless steel sheet metal bend to a 45-90 degree angle in a certain length. (Please check the angle with your existing flavorizer bar, before ordering). The grill flavorizing bars can be configured online by choosing the angle shape and entering the required measurements. Check here if you need more information on how to configure an custom made angle.